Flap Peening (also called Roto-Peening or Flapper Peening or Rotary Flap Peening) is a portable shot peening process, suitable for the localized treatment of small and difficult-to-access areas. Flap Peening is mainly used by maintenance and repair professionals for aircraft and helicopters, because it allows a shot peening treatment directly on the area to be treated, without disassembling the part. The Flapper Peening process can also be used for straightening applications on thin aerostructures. Download our brochure to know more about Flap Peening (or Flapper Peening or Rotary Flap Peening) and FlapSpeed Pro®. Flap peening uses a flap with its extremities equipped with balls embedded in a Kevlar matrix. The flap is installed on a shaft and rotated using a pneumatic or electric grinding wheel. The slap is then applied to the part to be peened or shaped and the end balls strike the part to treat it. The process is controlled by the rotational speed controller of the grinding wheel combined with the size of the flap. 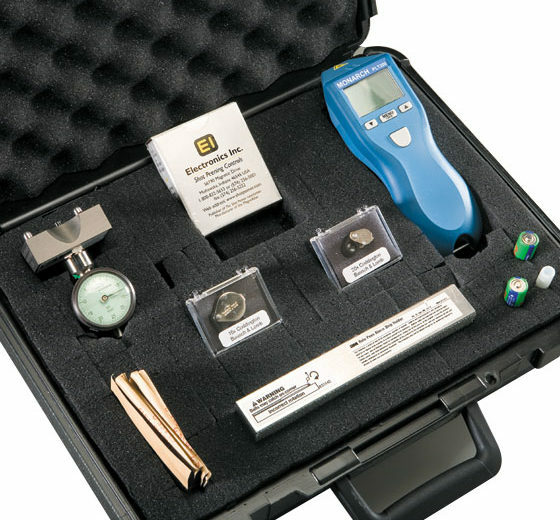 SONATS has selected a range of quality products and accessories for flap peening treatment. 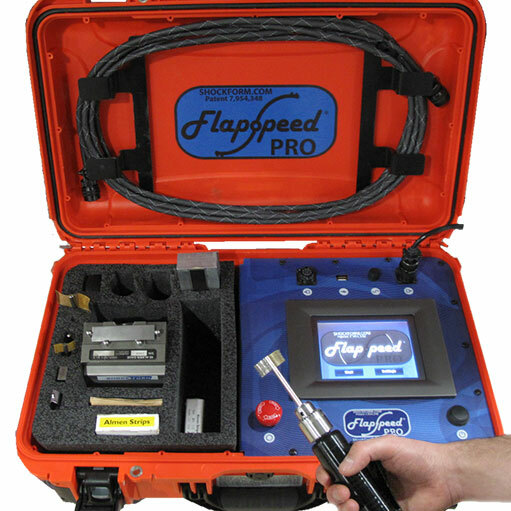 The flap peening equipment, the Flapspeed Pro® is sold alone or as a kit. The flap peening kit includes the essential accessories to carry out a precise shot peening operation while fulfilling the most demanding military standards. The essential controller for your flap peening treatments. The new NADCAP* requirements stipulate that the flap peening rotational speed (RPM) is measured and maintained to ensure compliance of the treatment with the required Almen intensity. Currently, the FlapSpeed™ controller is the only device that meets these NADCAP recommendations. The reference tool for Boeing BAC5730-2 rev D.
The new Revision D of the Boeing BAC5730-2 Specification now allows for flap peening/roto-peening without making an Almen strip or Saturation curve when using the SHOCKFORM FlapSpeed® Controller. The FlapSpeed® controller manages and readjusts the rotation speed of the flap in real time which allows to achieve the intensities required in the Boeing RPM vs Intensity Table. This technique greatly reduces the process qualification time by the operator and eliminates the purchase of Almen strips, gauges and blocks.